Orchids make up the perfect gift for the elegant people, just like you. Ferns N Petals has come up with a wide variety of hand-picked orchid flower arrangements for those who love to express their feelings in a royal manner. 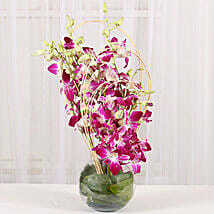 Gift these blossoming orchids to ones you love on special occasions like birthdays, anniversaries and as a valentine gifts etc. or even on no occasion. 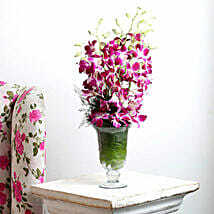 Blossoming like vibrant butterflies these Orchids are sure to cast their magical spell. This either bunch of flowers or artificial flowers online delivery is best suited for upscale people with class and elegance. You can make it even more mouth-watery by adding incredible chocolates to it. 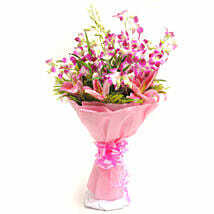 These flowers will surely be an extra delight for your loved ones in Ferns N Petals. 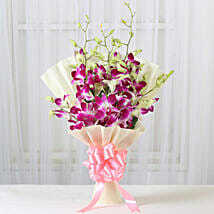 Orchid flowers will be an impeccable choice for occasions like Birthday, Anniversary, Wedding and many more to list down. 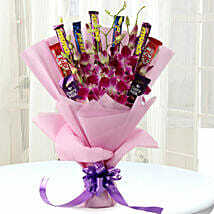 It can be flowers bouquet with a sweet and mild fragrance. 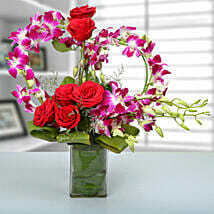 You can even go for fresh and crimson velvet roses or elegant lilies and exotic carnations to brighten up your life. These lovely and luxurious flowers is sure to bring charm into your life.You can get an online flower delivery done to all your dear ones. Our custom flowers including roses online delivery service will make your life a lot more convenient with its same and next day delivery service. You can send orchid flowers to all the metro cities like Delhi, Mumbai, Bengaluru and international countries too like USA, UK, Canada, Germany, Singapore and many more countries to list down. 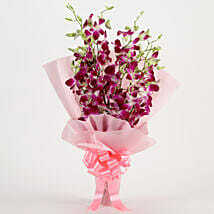 Flowers are the most divine creations of nature that are considered the perfect messenger of love and romance. That’s the reason, why flowers are generally gifted by lovers to each other on Valentine’s Day as an expression of their infinite love and care. You must have probably seen lovers exchanging red roses on V-Day as they symbolize the deep and passionate everlasting love. Have you ever thought of gifting your partner something other than roses on Valentine’s Day? 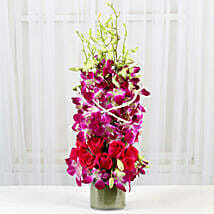 The orchids are as beautiful as roses and are said to be the symbol of love, beauty, and luxury. With their simplicity and exotic beauty, orchids will make a stunning flower arrangement to offer your beloved on Valentine’s Day and spice things up in your relationship. 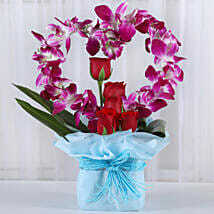 At Ferns N Petals, you can find a wide range of purple and blue orchid arrangements and bouquets at reasonable prices. These mesmerizing blooms are excellent to appreciate the beauty of your partner and brighten up their day in a romantic manner. You can also find the plethora of flowers for Rose Day on our website including red roses, pink roses, and yellow roses. It is also an important day of the Valentine week when lovers express their affection for each other by exchanging velvety roses. Apart from flowers, you can find several other online Valentine Day gift ideas on our portal such as soft toys, promise candles, tempting chocolates, and heart-shaped cakes. 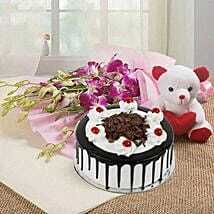 With these gifts, you can delight the heart of your partner and make their V-Day celebrations magical and memorable. A mother is like a blessing to her kids who loves them more than herself and knows them better than anyone else. She is the one who instills love, care, dedication, and compassion in her kids and sets an example by her good deeds. No matter what you do for your mom in life, it is never possible to pay back for her efforts and sacrifices that she made to give you a life of your choice. But you can always make her smile by gifting fabulous presents on Mother's Day. These gifts will become the true messenger of your love and show your mom how much you value her selfless love and care. Ferns N Petals brings to you a varied range of fresh & vibrant flowers for Mother's Day, such as roses, lilies, carnations, chrysanthemums, and daisies. 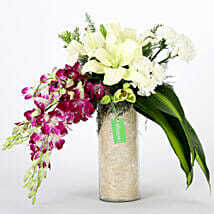 You can order a splendid Mother’s Day orchids bouquet or arrangement from our website to send your mom via our hassle-free same day and next day delivery service and wish her a fun-filled day. The gorgeous fragrant flower will mesmerize her senses to the core and set a happy tone for the entire day.